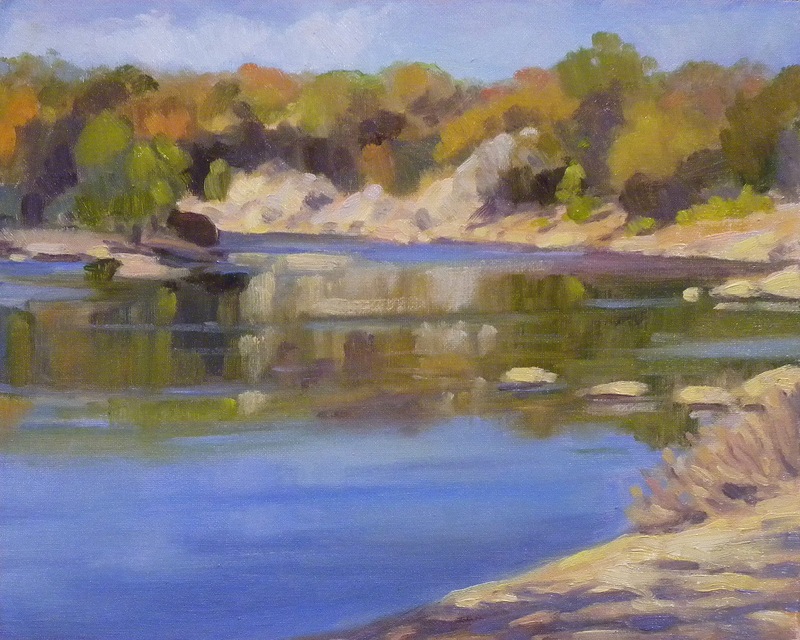 My Final Post and the last two paintings of 2011! What a beautiful day to wake up to! Considering what a difficult year this has been for so many and all the extraordinary natural disasters, it was encouraging to end the year celebrating such peaceful beauty as I experienced today. This was the first painting of the day which was to be filled with fast moving, wonderful cloud formations. Oddly enough there was hardly a breeze which made painting very easy. I guess the air was moving faster above. I loved the silvery effect of this morning light. This was my second and final painting of the day. All I did was turn my easel around and face north. The cloud show was magnificent! Just when I thought I had the best formation another wonderful one would float by. It was frustrating. I also found it difficult to get as much luminosity into the clouds as I wished. Adding a little cadmium lemon yellow to titanium white helped for the brightest spots. I want to thank all of you who have spent a few minutes visiting me and my work this year. I have only been blogging since July and I wasn't sure I would like it but I must say I do. It helps to put down my thoughts and I love the opportunity of reaching a much wider audience than I ordinarily would. I do hope some of you feel moved to leave comments from time to time. Feedback is always good to have. This has been a trying year for the world. My wish for all of us is for more peace, happiness and success and much less hatred, war and destruction. That may sound cliche but I can't think of a better way to state it. I hope the beauty I find in nature and that I try to express in my paintings says it best of all. So world, HAPPY NEW YEAR! Let's do it better in 2012! 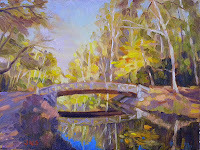 My Last Plein Air Painting of 2011? Maybe. 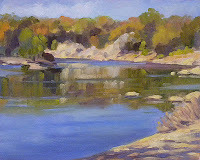 There is still tomorrow and I am sure I will want to get out and enjoy painting while this beautiful weather holds. I am on the Outer Banks of North Carolina in a small town called Duck. I love the winter light here! The narrow path you see weaving along the top of the dune in this painting was not made by humans. It is in fact a deer track. In the warmer months the vegetation on the dune is very thick and prickly. This is not a path you would want to follow at that time. In the winter, however, it is quite easy. This may not be a spot where you would expect to see deer but believe me they are here. There are lots of dense thickets and groves of live oaks that provide comfortable homes for numerous rabbits, deer and fox. Until recent years you would also encounter wild horses but the herd has been penned up in Corolla for its own protection. I can remember when they were still roaming free and I miss that. I would much prefer fewer houses and more horses! Just before I took this photo a gust of wind came up and apparently I didn't have my panel secured tight enough. The painting flipped forward and landed upside down (thank goodness) on the palette:) The back of the painting now looks like an abstract as I used my palette knife and paper towels to clean it up as best I could. I always carry painter's tape in my backpack and I wish I would remember to place a wad of it behind the panel as an extra precaution. If you are not new to this blog then you know this has happened to me more than once. I am a slow learner. ﻿ Since we only arrived a couple of hours ago I don't have any paintings to show you as yet. I was eager to hit the beach while there was still light and I enjoyed taking a few photos. I love the irredescent reflections of the sky on the wet sand. I walked for a while and then fed the dogs and caught the sunset on Currituck Sound. I would like to say you can expect some sunrise paintings but after the hustle of the last couple of weeks I think I will be sleeping through it! Maybe some more sunset studies though. I have continued my tonal paintings in the hope that I will end up with two that I feel pleased enough with to send to the Black and White Show at the Salmagundi Club in NYC. I have turned my attention to the space in my house where the bulk of my time is spent. I want to do more than simply record the space. I love it here, this is home, this is where I paint and am surrounded by books, paintings and objects I love. A recording of it is not enough. Years ago when I studied interior design (decided it wasn't for me and didn't follow through) we were taught to paint and draw interiors but that kind of work would not suffice here. How, with just a tube of Holbein's sepia and titanium white do I express how I feel in this space? I have been revisiting Rembrandt, Vermeer, and Sargent to name a few. There is a soul to the spaces they have painted. I know what my goal is but succeeding is another matter. 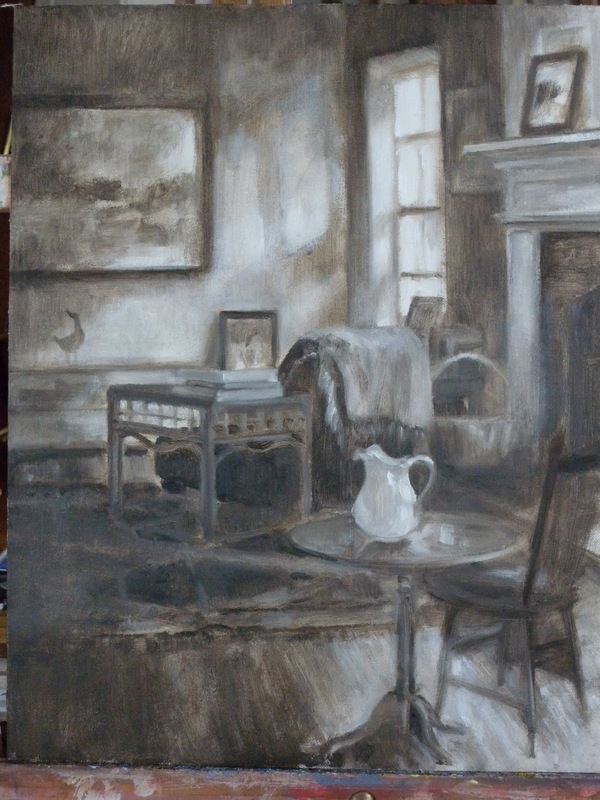 To the left is the underpainting which was done on a white panel. You will see that it is an enlargement of the little 8x6 study I showed you a couple of posts ago. You are looking into the room that opens into my studio. They are separated by glass pocket doors that I usually keep open so it is one continuous space. There is a short step up from my studio. I am standing at the easel and this is what I see everyday. Behind me are large windows facing north, east and south. In this room the window and the window alluded to in the painting are facing north. Today I got this far on the painting and feel I need to step back a bit. It needs some finishing but part of that finishing might be a "fuzzing" up of things, not so much a clarification. I don't want to get too precise. I am not cataloguing my space I am trying to infuse it with what I feel looking into it. Getting picky about the pattern of the rug is not going to accomplish what I want here. It is hard to describe what I mean but the light tells the story. OK, I'm getting cryptic. Artists can be a real bore when they start talking too much about what they are painting. I will know what I mean when I see it and hopefully you will too. I will continue to do more of these interiors but I am beginning to be eager to get back to color. I have been missing in action for a few days partly because of the busy Christmas season but also because I had difficulty accessing my blog. Since I usually do this at night I was just too tired to take the time to straighten the problem out. Tonight I decided to bite the bullet and so I'm back. I completed this small painting over the weekend. 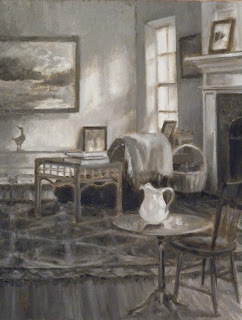 I let the natural linen color of this clear primed linen panel come through in places and I like the effect. I am working on these in preparation for the Black and White Show at the Salmagundi Club in January. This is their oldest running show and used to be quite famous. Works can be in black and white or sepia only. No color accents at all. I wonder if the warm linen coming through the cooler black and white would constitute a color accent. I don't think so but I should check. 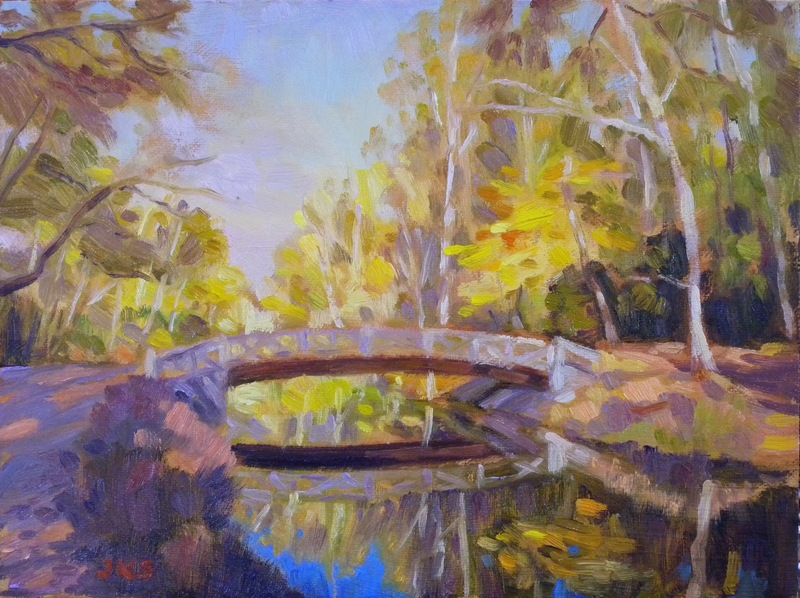 I don't have a title for this as yet but the subject is the Old Potowmack Canal which I have frequently painted and I recently exhibited a painting by that name. I'll have to come up with a different title if I send this to the show. I started another interior today which is a larger version of the one I showed you earlier and brings in more elements in the room. I will post it tomorrow even if it is not finished as I like to show works in progress. I just didn't remember to take a photo today. I spent the evening at the Art League Gallery in Old Town Alexandria where we just hung the December all media exhibit. 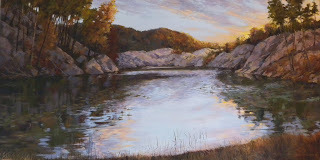 My painting "Evening Descends on Black Pond" was one of the paintings selected for the show. It was interesting that the jurors selected so many very large pieces this month. As you can see by the dimensions mine is on the large side but it was dwarfed by some of the other pieces in the show. I enjoyed the fact that there were so many large works probably because I have been attending all the small works shows that predominate at this time of year. Also, I am delighted to have a little more room in the studio now that two of my large paintings have left for Macedonia and this painting will be on exhibit for a month at the Art League Gallery. If I am lucky it will sell and find a happy new home. Those of us who hung the show felt we had had a real workout. Seriously, it was very physical work this evening and we were short handed. I forgot to ask how many works were accepted but I am guessing there were around 125 to 130. It is a very striking and colorful show with all styles and medias represented. If you are in the area it is a must see! 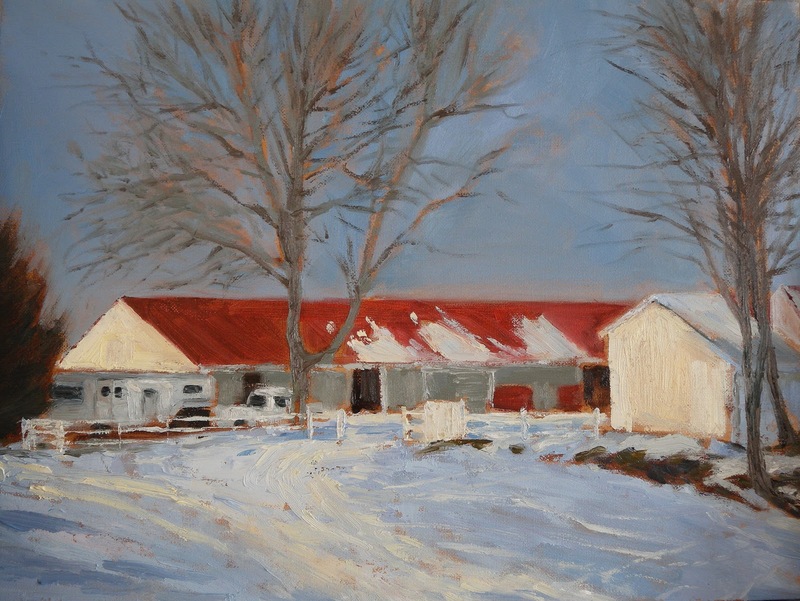 Also on exhibit at the Art League Bin Gallery for the month is "Red Roof" painted last winter. Looking at it I do look forward to doing more snow pieces. I only did two last year and I love the possibilities but have to find a better way to deal with the cold. Last year some of the storms made driving prohibitive so I am hoping for moderate snow and a quick clearing of the roads. "Hope springs eternal". 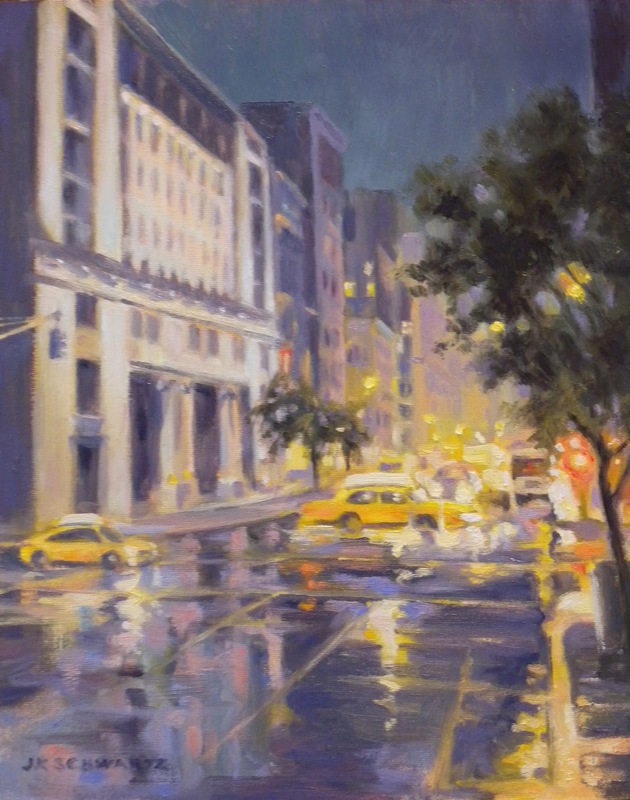 If you are in New York City you can see three of my small works at the annual Thumb Box Exhibit at the Salmagundi Club, 47 5th Avenue. 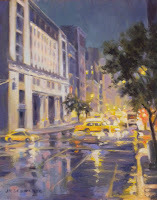 It will be running through the month of December and gallery hours can be found at http://www.salmagundi.org/ The paintings are "Rainy Night on Lower 5th", "The C&O Canal, Potomac Md." 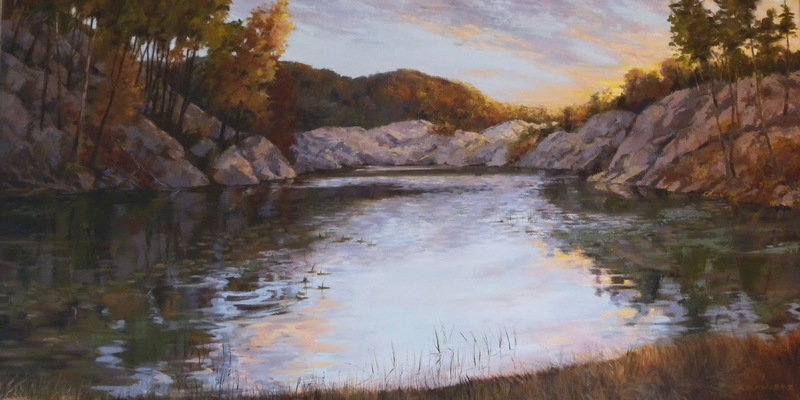 and "Morning at Wide Water, Potomac MD"
In my last post, which I was surprised to see was actually four days ago, I said I was going to embark on some interior paintings. I am really getting interested in that. This tiny painting on the left is a tonal study I did from my studio. This room is separated from the studio by glass pocket doors which I usually keep open. I was in the studio sitting on the floor with my books on Sargent, Greg Kreuz and the American Impressionists and just had to do a study right then and there. One of the reasons I wanted to do a tonal one is I had just read the prospectus for the annual Black and White show at the Salmagundi Club which is a show with a very long tradition and I would like to participate. 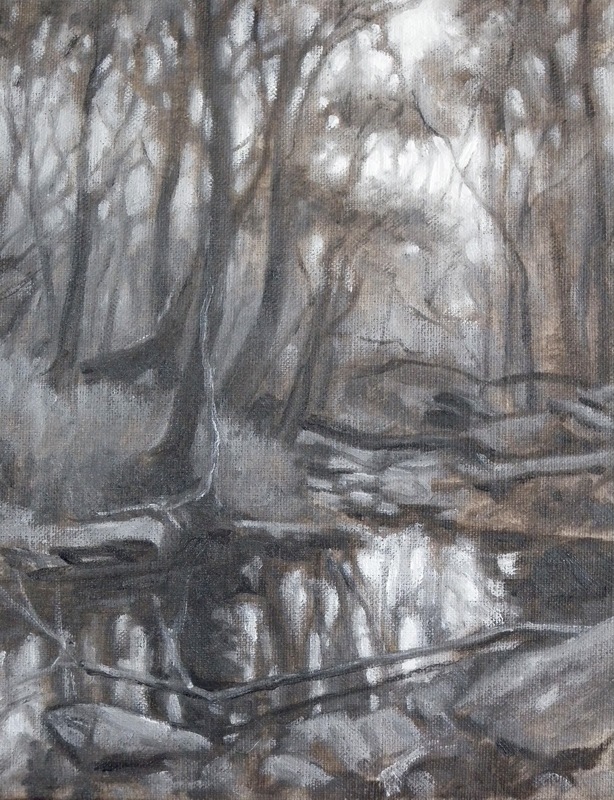 I had thought I would do drawings for it but then I decided I would rather do some oil sketches. We can do black and white or sepia but can't add any color at all. This little piece is a test run both for that show and for an interior painting. I like this one. I laid the paint on thickly and took a more sculptural approach than a drawing one. I am looking forward to expanding on it and doing it in color. The rug has some wonderful blue and burgundy colors that will look great against the golden wood floors. I know I have referred to the "pile" in the past. That is the growing stack of failed plein air pieces done on various types of panels. I said in one post that I keep them around both to remind me of what not to do but also because some have portions that have useful information for studio pieces. However, these are tough economic times and there are a lot of really nice panels just sitting there begging for a coat or two of gesso. So I took out some of the real stinkers and did just that. 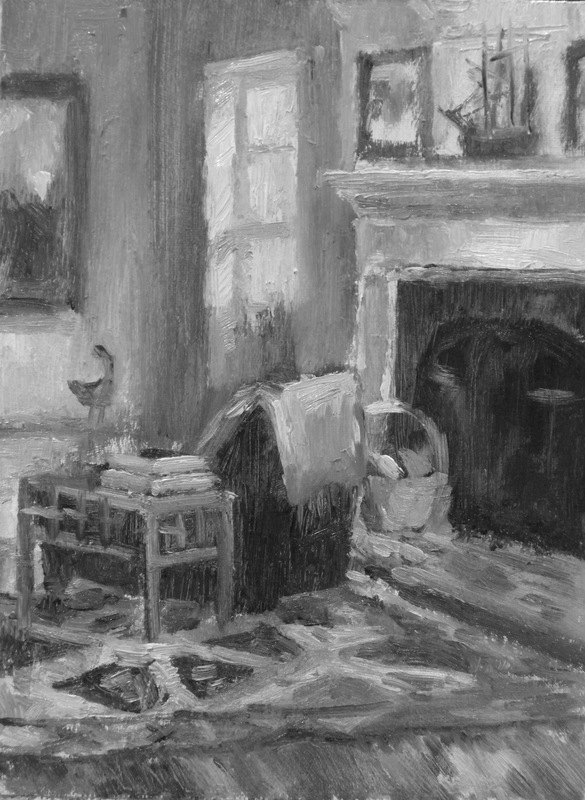 This little study is painted over one of those failures. I'm glad I did it. When I write I forget that not all of you have been following this blog so I apologize for referring to paintings and events like you are supposed to know what I'm talking about! In the last post I said that "Spring Rush" and "Between the Sun and the Moon" were picked up last Monday by the State Department's Art in the Embassies Program to be shipped to Soltje, Macedonia and the U.S Embassy there. I didn't show you the paintings. If you go to the blog Archive and look backwards to the post titled "I have almost finished my homework" which I think was in October you will find the paintings there and a link to Art in the Embassies. 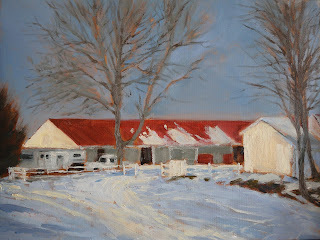 You can also go to my website http://www.jeanschwartzpaintings.com/ and see them there. I will be Christmas shopping all day tomorrow. I have five grandchildren, need I say more. I'll be back with more on interiors as soon as I can.